It's All Behind Me. Vol. VI. 1. Intro It's All Behind Me. 2. It's Been Long Enough. 3. I Just Wanna Serve You. 5. If It Had Not Been..
6. God Is Watching You. 7. The First To Say. 8. God Really Loves Me Back. 10. I Can Lean On. 15. God Still Works Miracles. 16. Remix I Can Lean On. Producers In The Country With His 6th Cd on Forgiven By Grace Records Called "It's All Behind Me" By Brother Jay. In The Music & A Groove 4 Your Soul.. Stuck In Your Dellimma.So Put It"All Behind You"
It Comes To Inspirational Soul & Urban Contemporary Music. Be Purpose.. In Your Work For Something Bigger Than You. 2.Brother Jay Do You Produce or Write for Other Artist. Produce His Project. He's Really Good.. I Say" Old Chap.ha ha . 3.Brother Jay Are You Married and have Children. Influence and Inheritance In The Life Cause " That's My Job" Thanks For The Interview LATER My freinds..
A Special Shout out To The Cdbaby Organization. TO THE BUSINESS AND THE WORLD.. CDBABY.COM HAS HELPED THIS VISION GO ALL OVER THE WORLD AND I TRULY,yES TRULY,REALLY SINCERELY APPRECIATE THEM, fROM HE bOTTOM OF mY HEART..
Bishop Larry D. Manning, Sr. Brother Jay this new CD is AWESOME and a testimony of where God has brought you from and if He did it for you this Cd is hope for others. Keep on praising and lifting up the Name of Jesus. I Just Wanna Serve The Lord! It's all Behind Me and It's Been Long Enough,I Just Wanna Serve The Lord.Like all 5 cd's,I love this 6th cd too!Keep Keeping It Real! 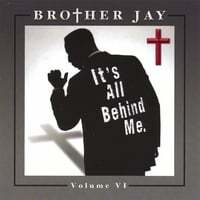 This CD, like all of Brother Jay's CDs is simply amazing. Brother Jay has am amazing gift. Keep up the great work Brother Jay! I love this CD, especially numbers 2 and 5. Brother Jay is a very talented artist who inspires me so much in his music. I pray that God continue to bless him and his industry because music like this should be winning Grammy's.